Just insert the card in the top slot and the ATR120 will automatically positon the card, print the date and time, and eject the card. This time clock supports weekly / bi-weekly or monthly payroll periods. The clock can be set to print "late in" and "early out" punches in red so they can be quickly identified. Making time card edits quick and easy. The clock has a built-in programmable buzzer that can be used to notify employees of shift start and stop times. A built-in battery baackup maintains the time even during a power outage. Automatic Daylight Saving Time adjustments mean fewer hassles for you. This model comes with a large, easy-to-read analog clock face. 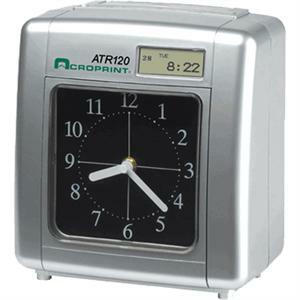 The clock requires the use of ATR121 time cards. Easy printing: insert the card in the top slot and the time clock will automatically position it. Weekly / bi-weekly or monthly pay periods. Optional NiCd battery allows employees to clock in and out even during a power outage, up to 200 punches. Dimensions: 8.25" x 5.5" x 9"